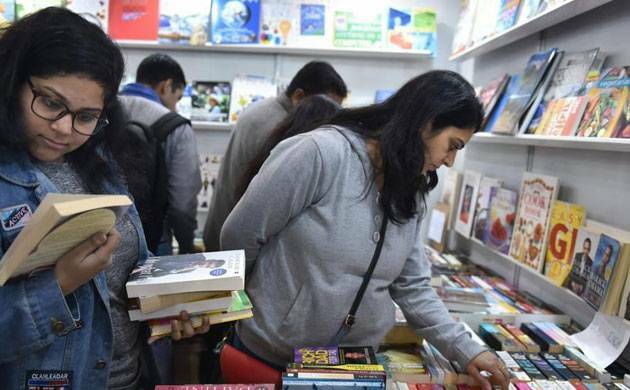 Themed around 'Environment and Climate Change', the 26th New Delhi World Book Fair opened here on Saturday with a call for increased awareness and efforts to protect the environment. The 9-day annual event was inaugurated by environmentalist Sunita Narain, European Union ambassador to India Tomasz Kozlowski, National Book Trust chairman Baldev Bhai Sharma and Madhu Ranjan Kumar, Joint Secy- Minister of Human Resource Development. Addressing the visitors through a video conference, HRD minister Prakash Javadekar said that climate change awareness is important as humans have exploited earth beyond limits. "We have taken more from the earth than it could offer. It is about time we realised the importance of awareness, and it won't be possible without collective efforts by not wasting electricity, water; by taking bicycle to travel or by walking more instead of using petrol and diesel-run vehicles," the minister said. Author-environmentalist Sunita Narain also spoke strongly about the effects of climate change and the need for awareness calling it the "biggest threat faced by the poorest of the poor". "The western world is talking and negotiating about environment change, they are holding meetings while here in India we are witnessing climate change with extreme cold, extreme drought and extreme rains. "It is no more an upcoming event, climate change is here. And the worst affected are the poorest people, the farmers, the marginalised. We don't need to be told about climate change, we are living it," she said. The book fair has a dedicated theme pavillion in Hall 7 E with books in English, Hindi and other Indian languages on environment-related issues like climate change, global warming, water and air pollution. Kozlowski also emphasised the role of books in spreading awareness about climate change. "The most important aspect of a book fair is the participation for general public, and with the event's theme of environment and climate change we hope to spread the message to as many people as possible. "The fair has a very high reputation of creating awareness and bringing change in the society. It is a medium to develop cultural ties between India and the European countries," the ambassador said. Over 20 European Union countries will participate with a delegation of publishers, editors and authors. The EU pavilion will also showcase some of the latest publications in English and other European languages along with panel discussions, talks, photo exhibits and cultural performances. Apart from the EU nations, more than 40 countries including Canada, China, Egypt, Pakistan and United Kingdom will participate in the book fair. The author interactions will be held at five Authors Corners in Reflections (Hall 11), Conversations (Hangar over lake), International Events Corner (Hall 7A), Lekhak Manch (Hall 12-12A), and Sahitya Manch (Hall 8).